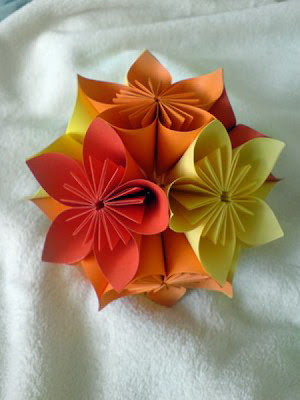 A pretty kusudama flower can be made by folding five or six square pieces of paper. 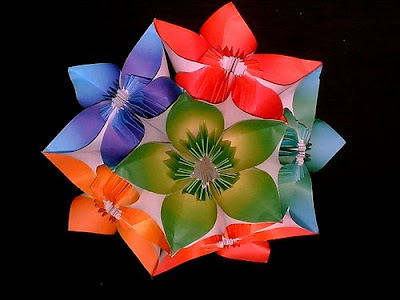 If you make twelve flowers,they can be assembled into a beautiful kusudama ball. Even if you use colorful sticky notes, the result is very impressive and can be used for decorative purposes or even worn as a temporary brooch. Here i explained step by step method for kususdama flower making. cut around 60 square pieces each of 7cm x7cm. or u want (any size of your flower). 2. Take the paper square, and fold it in half the diagonal way. It should now look like a triangle. 3. Take the two 45 degree angle flaps, and fold them to the top point. You should now have a formed square. 4. Fold the flaps backwards, half way, so that the folded back edges line up with the edges of the square beneath. 5. Unfold flap from both the sides as shown. 6. Turn it over. Fold one of the triangular flaps in, against itself. As shown in the figure..
7. There should be a crease going along the middle of each of the two flaps or triangles, fold along those creases. image. Using a glue stick may be a good idea, since it dries so quickly, or you can use white liquid glue as shown here. 9. Take the folded flaps and bring them together, fastening them in place, it may slip off, so you could try lightly taping it together, or hold it in place. 10. Apply glue to the "center" of each piece. The "center" is where the folded edges meet (where they were glued together previously). Spread out the glue so that the centers of the pieces can stick together securely. 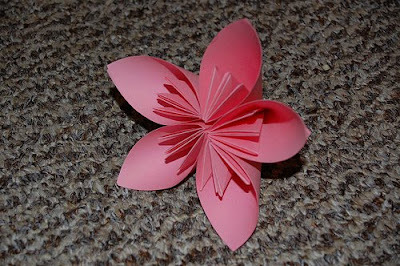 Wait for the glue to dry completely, otherwise, the petals will slip apart. Repeat with all of the other petals. Glue everything together in a circular formation. Using paperclips to hold the petals together works well. 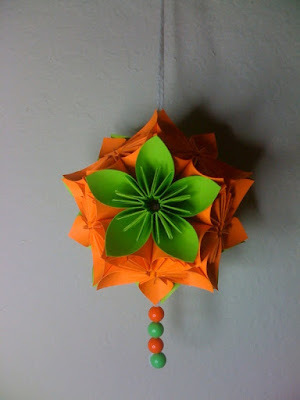 Here is the way to make Kusudama ball.